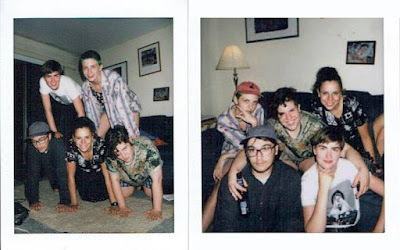 The Le Sigh: Premiere: Mothpuppy - "Flea"
Stream a new song from Baltimore's Mothpuppy ahead of their new album. Baltimore-based band Mothpuppy captures a raw, invigorating sound with their emotionally rich songwriting. Morgan Murphy, the leading force of the five-some, first started recording songs at Goucher College before enlisting her friends to join as well. Her voice is especially striking on “Flea,” the first single from their upcoming album Cool and Pretty, that will be released on March 10th via Sad Cactus. Murphy has learned the power of her heart, transforming even the wildest emotions into something that feels calm and centered. “Flea” is a dreamy, abashed waltz with gentle notes to reassure the self. Murphy proves that disclosing your darkest moments can be empowering as she depicts a relationship on the edge of combustion. She croons with a palpable sense of unease creeping into her heart, “Why did you kill me / My body was perfect / Free of all defects / I latched on to you.” Murphy delivers each poetic line in a way that's beautifully sketched together, as if torn from the pages of a Maggie Nelson novel. A flowy, slow strum of guitar whips around chimes of violin as Murphy’s voice looms even larger. She isn't afraid to reveal the stark realities of sharing your life with another person. There's often a bitterness ringing in Murphy’s words, but there's also an ember of hope for the future at the song's core. Murphy sings defiantly as guitars swirl around her, gesturing to the big picture,“When you think of this small death / I hope you’re afraid to speak.” Listen to "Fleas" below and you can pre-order the album here. Listen to Mothpuppy on bandcamp.